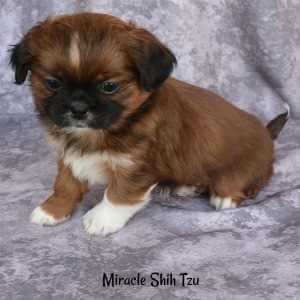 Shih Tzu Nursery A is now closed. We're waiting to fill it with more puppies, but we must be patient. Our next litter is expected at the end of March: Lucy and Timi tied the knot and we're hoping for some amazing babies with incredible colors. Timi is lavender (liver) and Lucy is Blue. Taking bets on what colors you think they'll be. If you want to wager a bet, contact me. Proud Participant in AKC's Bred with H.E.A.R.T Program since 2015. 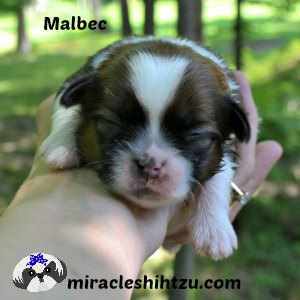 Want to see some of our previous puppies. These pups are all sold and have gone home to their forever families. 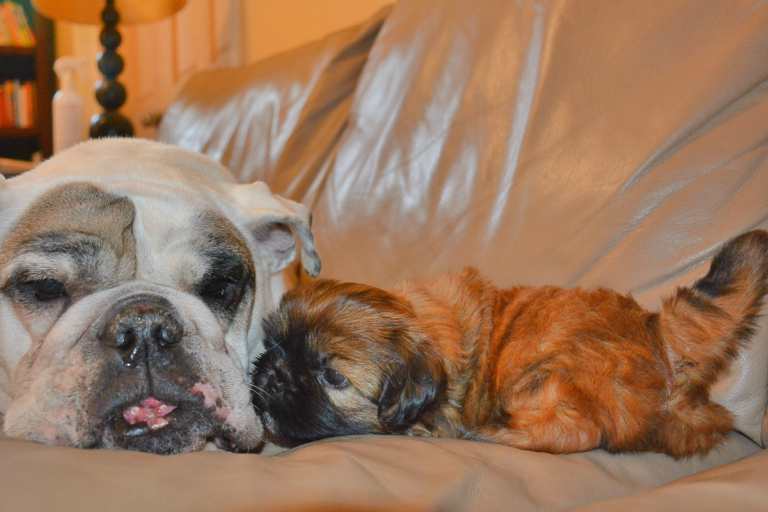 Helda our pet English Bulldog doing a little babysitting on the side. Agree to provide DNA testing and other health screenings for all breeding females and males. 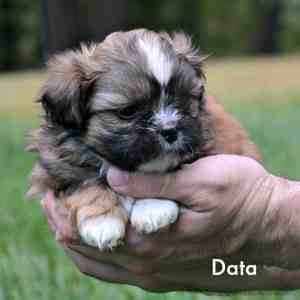 Sales Tax on Puppies: Attention Ohio Residents. NEW: The state would like their share. 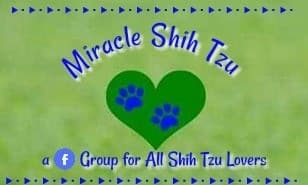 It has come to our attention that we must collect Ohio Sales Tax for all puppies we sell to residents of Ohio. We live in Summit County and the tax rate here is 6.75 percent. 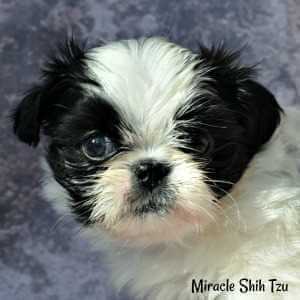 If you purchase a puppy from us and live in Ohio, please add sales tax to your total purchase price. If you do not live in Ohio, there is no sales tax. 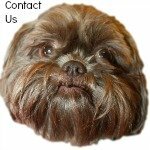 If you are a small in home breeder and would like full AKC registration, we may be able to offer it to you. Please use the contact form to inquire about full AKC registration. 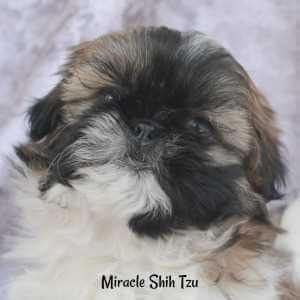 All available puppies from our Shih Tzu Nursery A come to you up to date on vaccinations and wormings. 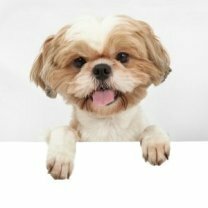 We currently worm for Roundworms, Hookworms, Whipworms, Giardia, Coccidia and any other worms that can be killed using the products recommended by our Veterinarian, Boston Heights Veterinary Hospital. We current worm at two weeks, four weeks, six weeks and eight weeks with: Nemex, Fenbendazole, and Albon. 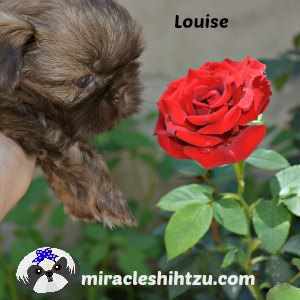 We vaccinate at approximately 7 weeks of age and they would be do for a booster at 11 weeks. Always check with your veterinarian for their recommended vaccination schedule. 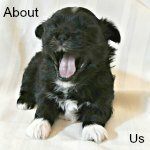 Most puppies are ready to go to their forever homes on or after 8 weeks of age. 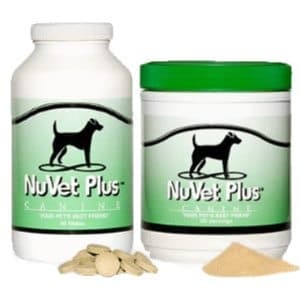 We also give our dogs on NuVet Plus, a human grade supplement food supplement that contains natural vitamins, minerals, herbs, antioxidants, bioflavonoids,fatty acids and amino acids proven to combat the ravages of free radicals and provide immune system support. 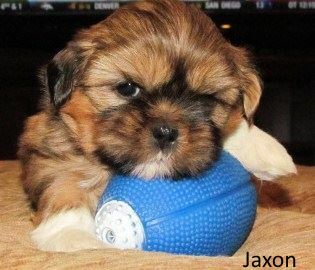 A non refundable deposit of $200.00 holds your puppy. We accept checks, cash or PayPal for the deposit. We require the remainder of the fee is due when you pick up the puppy in cash. 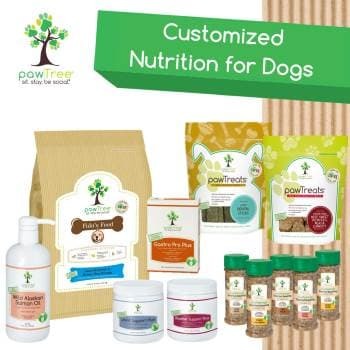 Our free puppy package to you includes a bag of food, several toys and chews, and a sweet Mama scented blanket. 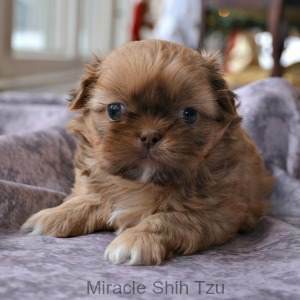 All purebred pups are registered with the American Kennel Club (AKC) and limited registration is included in the price of the puppy.